Wellington, FL - February 18, 2011 - Two-time Olympic gold medalist Beezie Madden of Cazenovia, NY, rode Abigail Wexner's Mademoiselle to victory in the $31,000 WEF Challenge Cup Round 6 today at the FTI Winter Equestrian Festival (WEF). The grand prix was held on the grass at The Stadium, and riders and spectators alike enjoyed the beautiful weather and change of scenery at the venue. 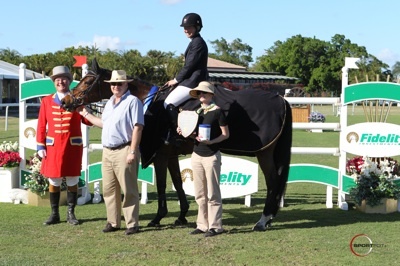 The FTI Winter Equestrian Festival's sixth week of competition continues through Sunday, February 20. Week six, sponsored by Fidelity Investments, will feature the FTI Great Charity Challenge presented by Fidelity Investments, on Saturday at 7 p.m., the Suncast 1.50m Championship Jumper Series Classic on Saturday afternoon, and the $50,000 G&C Farm Palm Beach Jumping Derby on Sunday at 3 p.m. at The Stadium. 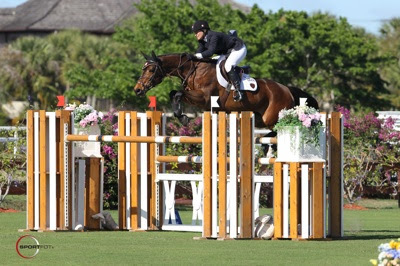 The 2011 WEF will continue through April 3 and award more than $6 million in prize money. There were 29 entries in today's class, and the course was designed by Richard Jeffery of Bournemouth, England. The course was set on the grass field at The Stadium and had 14 numbered obstacles with a triple and a double combination. There were nine clear rounds, and they advanced to the jump-off to compete for time. The first to go was Candice King (USA) on Skara Glen's Davos. They set the time to beat at 44.88 seconds and had no faults, and this would hold up for third place. Ben Maher (GBR) on Lindsay Cook's Oscar, Catherine Pasmore (USA) on My Boy, owned by Pasmore Stables, and Ashlee Bond with Little Valley Farm's Cadett 7 would all fault at one jump and finish in sixth, fifth, and fourth places respectively. Mario Deslauriers (USA) and Jane Clark's Vicomte D, as well as Pablo Barrios with G&C Sinatra, would have eight faults and finish in ninth and eighth places. Hector Florentino (DOM) and Ultimo, owned by Stransky's Mission Farm, had four faults for seventh place. Ward said afterward, "The horse is very, very careful and I got a little deep to the second to last and he went very high. It was a five or six (strides) and I decided to do six mid-air. In hindsight it was a little slow and definitely opened the door a crack for Beezie to slip into. It wasn't a big mistake, but it was room to lose the class. I knew when I was doing it, I thought 'Oh this is slow.'" Madden added, "I watched McLain go in the jump-off. He was pretty fast everywhere else. It's a quick horse, other than it jumps high so it spends a little time in the air like it did over the second to last jump. My horse has a little more experience. She's quicker through the air, and she's pretty quick across the ground. I got stuck a little at fence two because the eight (strides) got steadier than I thought. Then the same as McLain, I didn't catch a great one to the skinny, but I was definitely faster to the last line and down to the last fence." This was Madden's first grand prix win of the 2011 FTI WEF, and she was excited to have her second big win at The Stadium. 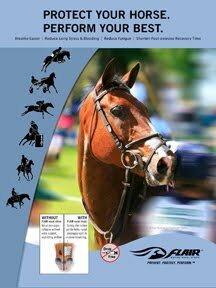 Madden won the $75,000 grand prix last year with Coral Reef's Via Volo. She said with a laugh, "It's my venue good or bad, I guess! 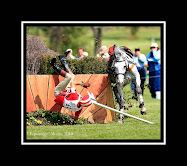 I did fall off in the (WEG) trials last year here! I like this field. The horses seem happy on it. It's a nice change and refreshing; it makes you feel like you're at a different horse show." Ward echoed Madden's thoughts on the change of venue for the class, "I think this is a beautiful venue. The footing is excellent, and it's a nice change of pace." Ward complimented his mount, Pjotter van de Zonnehoeve, who he has only been riding for a year and who started in the Low Schooling Jumpers with Ward. "I'm very impressed with him. He won seven or eight big classes in Europe last summer. He's a great horse. It's very nice for Beth Johnson to let me ride him. I think we're a good partnership and I really enjoy him. His strongest suit is that he's careful, and he's very willing. He's a little bit of a nervous horse, but I think my ride suits him because I give him confidence. I think he responds by trying everything I ask him to do, whether he's sure of it or not. He's a very talented horse." Madden was pleased with Mademoiselle, who has been "a fantastic horse to have." She continued, "I got her just before the trials last year. She's great to have in a class like this. You can go in and try to win. She's easy to ride and she gives you confidence."